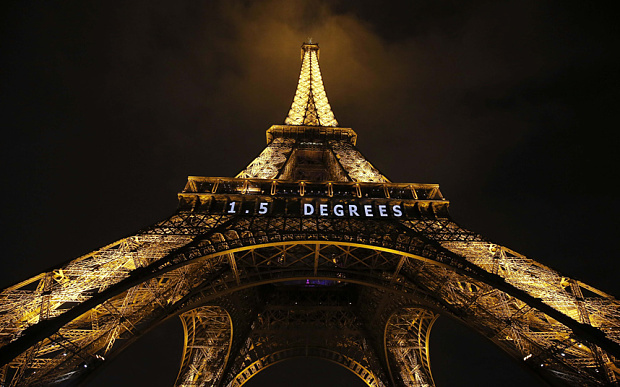 "1.5 Degrees" in white neon is lit on the Eiffel Tower in the French capital, as the COP21 United Nations Climate Change Conference takes place at Le Bourget, on the outskirts of Paris. (by Christopher Booker, Daily Telegraph) – As the mammoth Paris conference ran well into overtime, it was already clear that, in the battle “to save the world from global warming,” we have at last reached a historic turning point. The aim was to get a treaty committing 196 nations to stop global temperatures rising more than 2 degrees C or even less above their pre-industrial level, by wholesale “decarbonizing” of the world’s economy. We must all stop using those “polluting” fossil fuels which still provide 86 per cent of global energy. To this end, the world’s richer “developed nations” would also give $100 billion a year to all those countries still “developing,” to enable them to rely only on “clean” energy, and to adapt to the problems created by climate change. As explained by the conference’s chief organizer, Christiana Figueres, this would amount to a total revolution in the way we all live: nothing less than to abandon the entire “economic development model” that has been shaping the world since the Industrial Revolution. The essence of this vision goes back to Maurice Strong’s Rio “Earth Summit”in 1992, which first laid down the principle that it was the duty of “developed” countries, those which caused global warming in the first place, not only to make drastic changes in their own way of life but also to pay for poorer nations to catch up with them. It is this distinction between the “haves” and the “have nots” which has bedevilled every one of the 21 UN conferences gathered to discuss all this since Rio, from Kyoto in 1997 to the fiasco of Copenhagen in 2009 – and above all for one reason. The “developing nations,” led by China and India, have always insisted that there is no way they can hold back their own economic growth by cutting back on the fossil fuels which made the developed countries rich. In the run-up to Paris, every country was asked to provide its plans for the next 15 years. China, already now responsible for half the world’s “carbon emissions,” said it plans to build so many more coal-fired power stations that by 2030 its CO2 output will double. India, now the world’s third-largest emitter, said its emissions will triple. There are currently plans across the world to build 2,500 more coal plants, because coal is easily the cheapest source of energy. It is this which has been the scarcely noticed elephant in the room in Paris. Whatever clever words are devised to hide the reality of what emerges from this conference, there is no way the world as a whole is going to reduce its greenhouse gas emissions. Equally contentious behind the scenes, prompting the US Secretary of State John Kerry at one point to threaten to walk out altogether, was the idea that the rich countries of the West are genuinely prepared to shell out $100 billion every year after 2020 to help poorer nations rely only on wind and sun for their energy. So does this matter? Few pleas were heard more often in Paris than those from “small island nations” such as Kiribati in the Pacific, whose president insisted that, unless the rise in world temperatures was kept below 1.5 degrees, his country would soon be “underwater” from rising seas. In fact, far from being inundated, the latest study shows that its area has in recent decades been expanding. As many now also recognize – however fiercely it is denied – the late 20th century rise in temperatures, which set off the warming scare in the first place, has simply not continued. The pressure to keep the panic going dies away a little further with each passing year. So Paris does indeed mark a historic turning point. It is the moment when the political panic over climate change finally begins to collide with inescapable realities. However much President Obama and the EU may still want to commit economic suicide by abandoning those fossil fuels which alone make modern civilisation possible, the rest of the world just isn’t going to follow. And this leaves us in the West in a very odd position. Published Dec. 12, 2015 at London’s Daily Telegraph. Reprinted here Dec. 17, 2015 for educational purposes only. 1. The purpose of an editorial/commentary is to explain, persuade, warn, criticize, entertain, praise or answer. What do you think is the purpose of Christopher Booker’s editorial? Explain your answer. 2. What is the main idea of this editorial?